SWEPSYM was established to focus attention on precipitation extremes in Southwestern North America, and their impact on regional hydrology and water resource management. Southwestern US water resources are dependent on precipitation that exhibits significant interannual variability, primarily due to the dominant influence of extreme precipitation events on annual precipitation. Adding to the complexity in understanding the role of extreme events in southwestern US flooding and drought development is the region’s bimodal precipitation distribution; featuring significant contributions from both atmospheric rivers during winter and the North American monsoon in summer. SWEPSYM focuses attention on the continued investigation of the origins and impacts of both ARs and monsoon precipitation, as well as their role in flooding and drought development in historical and climate change contexts. 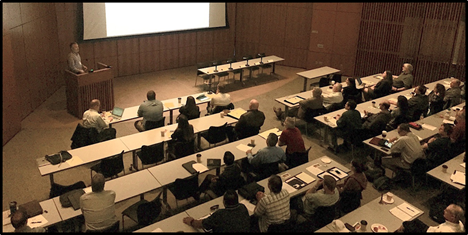 A goal of the Symposium is to bring together researchers and stakeholders with a goal of improving communication and collaboration between the two groups for advancing understanding of the hydrologic cycle in the Southwest and improving regional water security. The theme for the inaugural event was: Southwest U.S. Droughts and Floods: Past Events and Future Changes. The Symposium brought together researchers, engineers, and practitioners to exchange technical and scientific information about the various factors responsible for producing extreme precipitation and the hydrologic processes responsible for generating runoff in semi-arid and arid areas, both in a historical context and with an eye towards projected changes in the coming decades. Various topics related to flooding and drought in the Southwest were presented by a diverse group of speakers from academic institutions, government agencies and public utilities. Among the speakers was Dr. Marty Ralph, Director of CW3E at Scripps, who presented on recent developments in understanding the meteorological origins of extreme precipitation in Southwestern U.S., and Jeanine Jones, Interstate Resources Manager for the California Department of Water Resources, who discussed the need for improved precipitation forecasting for better Colorado River Basin drought contingency planning. The Symposium’s agenda additionally included talks featuring both historical perspectives and climate projections, providing insight on how current conditions compare to historical climate, and what changes are to be expected. For example, Dr. Matthew Kirby (pictured below), Professor of Geological Sciences at Cal State Fullerton, delivered a presentation titled Lake Sediments Reveal Southern California’s Long History of Droughts, Pluvials, and Floods, demonstrating the value of taking a historical perspective on understanding the current state and future fate of water resources in the Southwest. His talk was complemented by a presentation by Dr. Alex Hall, Professor of Atmospheric Science at UCLA, who discussed research results indicating robust evidence for increasing precipitation extremes in California based on an ensemble of downscaled climate projections. Dr. Mike Anderson, the California State Climatologist, capped the day’s talks with a presentation on informational needs for long-term water resource management and planning in the Southwest, which synthesized how research can support water management, regionally. Dr. Matthew Kirby of CSU-Fullerton delivers a presentation on the use of lake sediments to reveal Southern California’s history of droughts and flooding. 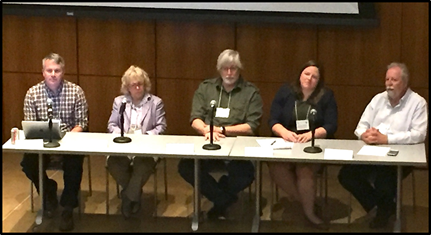 Speakers were re-convened in a panel (pictured below) at the end of the morning and afternoon sessions to discuss how to translate novel research that improves understanding of precipitation and hydrology in the Southwest into actionable information that benefits engineering, water management, flood control, and agriculture. Pictured from left to right: Dr. Matthew Kirby, CSU-Fullerton; Jeanine Jones, DWR; Dr. Michael Dettinger, USGS; Dr. Amanda Sheffield, NOAA-NIDIS; Dr. Marty Ralph, CW3E, Scripps. Despite the large body of published work on both atmospheric rivers and the North American monsoon, gaps remain in understanding, observing and predicting these weather phenomena.